No matter what you buy, your item will ship free. All our purchases come with a no questions asked 30-day return. All items come with a manufacturer's warranty. Shop confidently - we are a verified SSL secure website. Single vanities or single sink vanities are great additions to medium and small bathrooms. Our catalog includes a great selection of modern single vanities including freestanding and wall-mounted installations. Get high end vanities at wholesale prices with free shipping at Luxury Living Direct. With our custom vanity program, you can swap out components for an extra, personalized bathroom experience. Bathroom vanities are a combination of both functionality and style. There is a wide range of different vanities for your bathroom including single vanities. Finding the right vanity usually entails looking for the best material to match the tile and style of your bathroom. Customizing your single bathroom vanity with decorative knobs and faucets and an elegant countertop also gives it an extra touch of personalization. You can choose from many different styles ranging from traditional to modern vanities and many different sizes. There are also many popular bathroom vanity sets available for you to choose from. Single Vanities by Different Sizes - Don’t think that single vanities are simply for small bathrooms or guest bathrooms. There are many different widths of single vanities that will accommodate for a variety of different size bathrooms. Ranging from under 29 inches to over 79 inches, size won’t be an issue for your home decor. Large single bathroom vanities can easily bring an extra touch of sophistication to the look and feel. Whether you are looking for a 30 inch single sink bathroom vanity or a 60 inch, you can be sure Luxury Living Direct will be able to provide you one of the largest selections in the industry. Traditional Style Vanities - Traditional Bathroom Vanities offer more conventional and classical looks to your home bathroom. There are many different looks to traditional style vanities including different moldings and finishes. Our single sink vanities offer an innovative use of efficiency with self closing drawers and cabinetry to cover all your necessities. Modern Style Vanities - A modern single sink vanity can help keep your bathroom looking up to date. For newer homes, a modern vanity can create a luxurious and sophisticated look. Freestanding single sink vanity achieves the modern style very well. Wall mount single sink vanities are able to give off a futuristic and modern look. These vanities look as if they were floating in air. 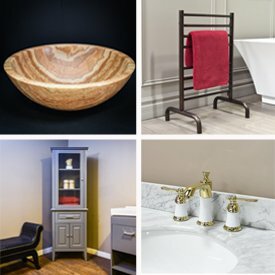 If you are looking to keep your bathroom looking fresh, our large collection of unique designs. Our decorative, modern single vanities will leave an astounding look to your home decor. Bathroom Faucets - The bathroom faucet you choose can make or break the look of your vanity. From polished chrome faucets to the traditional bronze and nickel faucets, find the best faucet to refine the look of your bathroom. We offer many different installation types such as single hole, wall-mount, and freestanding faucets. Bathroom Sinks - If you are customizing your single sink vanity, you will need a beautiful sink to furnish it. Choose from a large selection of types of washing bowls made from different high quality materials such as granite and marble. We also have sinks of different types such as square and oval shapes. Let your vision of your bathroom vanity become a reality and start customizing today! Benefits of Single Vanities - Single Vanities are very flexible when remodelling your home. They allow a lot of extra space in case you also want to install a shower and tub in your bathroom. There is also a lot more space for storage as there is less plumbing running through the vanity compared to a double vanity. If you are worried about limited countertop space, you need not worry as there is sufficient room to put all your everyday toiletries. If you are having trouble looking for a specific vanity or if you need any guidance in choosing the right design, contact our friendly customer representatives at (800) 574-3022 and they will be happy to assist you.